The testo 338 is an electronic portable industrial diesel smoke test meter with Bluetooth that allows quick measurement of soot from a disel engine. The testo 338 is easy to use, portable, rugged, and fast to operate. It only requires one hand to use and with the touch of a button can link to printers via its IRDA sensor. After the diesel emissions measurement, soot concentration (mg/m3) as well as the degree of blackening is displayed as either a FSN (Filter Smoke Number) or as a Bosch number. The testo 338 is ideal for any diesel powered engines, including marine engines, industrial engines used in mining and prospecting, and construction machines. Diesel engine manufacturing: Manufacturers of diesel engines often need to meet the customer's requirement of proof of the degree of blackening of the engine. This value is sometimes even documented in the purchase contract. For the purposes of diesel engine acceptance, you can record the degree of blackening with the smoke tester testo 338, and provide your customer with corresponding proof. If your customer wishes for a printout of the measurement data, this too can be provided directly at the measurement site with the optionally available Testo fast printer. Lifting vehicles: Diesel forklift trucks and earth-moving equipment must be regularly tested and serviced, sometimes even according to legislation or cooperative regulations, e.g. TRGS 554 in Germany – especially if they are working in closed rooms. A smoke tester is ideal for testing the Bosch number on diesel engines in forklift trucks and earth-moving equipment. Shipping companies and dockyards: On ships, as little visible smoke should be produced as possible, and the soot content kept to a minimum. A high soot content on deck can lead to the danger of soot deposits on the passengers. In order to test whether the smoke count of marine diesel engines does not exceed the prescribed limit values, shipping companies (and port authorities) can use a smoke tester. Use of the instrument provides clarity regarding the smoke values.In shipbuilding, the smoke count also plays an important part. After individual components have been assembled (engine, diesel particle filter, exhaust pipe), the soot emissions should be tested. In addition to this, for environmental reasons the customers often make demands regarding the emission values, and require proof of the soot emission in the diesel exhaust. The correct functioning of the diesel particle filter can also be testing using a degree of blackening measurement. Mining and prospecting: In mining, there are stipulations set by law or by professional cooperatives (e.g. the BGR 160 in Germany), which prescribe certain limit values for degree of blackening and the intervals for testing diesel engines. Limited fresh air supply means that the adherence to prescribed emission values in mines is crucial. Otherwise this can lead to health risks for the workers. For this reason, regular smoke count measurements are either compulsory or at least strongly recommended. Tests before the commissioning and servicing of diesel engines: The degree of blackening of diesel engines should be measured before commissioning and after servicing. With this measurement, you can for example test whether the fuel injection is correctly adjusted, and identify and remedy interior engine problems early. You as a service technician can carry the handy smoke tester testo 338 easily with you as you travel from job site to job site in order to carry out these measurements. 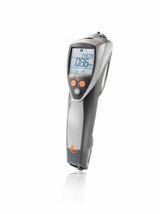 Click the button below to add the Testo 338 to your wish list.